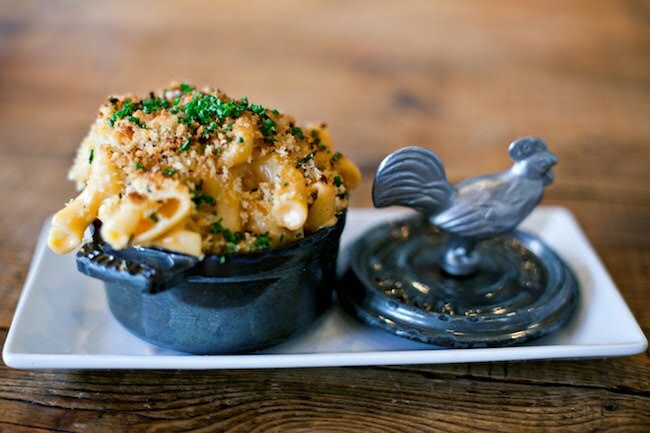 Miami-based Yardbird Southern Table and Bar—with locations in Las Vegas and Singapore, and cropping up in Beverly Hills soon—prides itself on its Southern-style comfort food. When it comes to macaroni and cheese, CEO/chef John Kunkel prefers to use torchio pasta as it “works very well to scoop up and hold onto heavier sauces. The pasta also has small ridges that hold on to the sauces.” Kunkel adds that homecooks can use any pasta shape, but to try sticking to textured varieties that can similarly hold on to the cheesy sauce. 2. Prepare the mornay sauce: melt the butter in a small saucepan over medium heat; add the flour, whisking constantly. When the butter and flour is blended completely, add the milk, whisking rapidly. Continue whisking until the mixture is thickened. Add in the four cheeses and stir over low heat until the cheese melts; remove from heat. Add the paprika and season with some salt, hot sauce and dijon mustard. 3. Meanwhile, cook the pasta in salted boiling water until al dente; drain. 4. Toss the pasta in the mornay sauce over medium heat until well coated. Sprinkle the cheddar cheese over top and place in the oven for 45 minutes. 5. Remove from the oven and let cool slightly; sprinkle with the chives and breadcrumbs before serving. One more tip: “The pasta should be fully cooked through to al dente,” says Kunkel. “However, right before you add the pasta to the mornay, you want to flash it in boiling water for 45 seconds.” As always, go with your gut to make sure that the pasta has some bite so it holds up while being cooked in the mornay sauce.